Ad showing retailer's planned discounts focuses on consumer electronics like a Samsung 50-inch plasma HDTV, Magnavox Blu-ray player and Xbox 360. NEW YORK (CNNMoney.com) -- Wal-Mart is highlighting flat screen TVs, Blu-ray players, Xbox 360 consoles and home computers in its much-anticipated Black Friday deals this year, according to a copy of the retailer's circular obtained by CNNMoney.com. 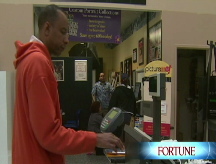 Black Friday - the day after Thanksgiving - is one of the busiest shopping days for the nation's retailers. Black Friday is of particular interest this year because the country is experiencing a sharp slowdown in consumer spending. Wal-Mart (WMT, Fortune 500) is not expected to officially unveil its Black Friday deals until Nov. 24. But as more Americans cut their holiday gift budgets this year, many will likely turn to discounters such as Wal-Mart in search of bargains. According to the circular, Wal-Mart's so-called doorbuster deals offered between 5 a.m. and 10 a.m. ET will include a 50-inch Samsung plasma HDTV ($798), Magnavox Blu-ray player ($128), Xbox 360 ($199) sold with free Guitar Hero III Legends of Rock game and wireless guitar, HP Pavilion desktop computer ($398) and a UniFlame gas grill ($175). Wal-Mart spokeswoman Melissa O'Brien declined to address the leaks from the Black Friday sales circular, saying only that "we plan to share the facts directly with customers on Monday, Nov. 24th." Still, the retailer in recent days has made no secret of its intention to aggressively court this year's budget-conscious holiday shoppers. Last week, the retailer said it would offer more discounts on thousands of products over the next seven weeks. Judging from other leaked Black Friday ads, additional retailers are also readying huge discounts in a bid to tempt reluctant shoppers. Sears' leaked Black Friday circular, which appeared last month on Gottadeal.com, a Web site that markets itself as one of many "official" Black Friday deals sites, showed the retailer would offer deals on washer-dryers, a category that Sears' hasn't heavily promoted in the past. One of Sears' standout deals for Black Friday is a Kenmore high efficiency front-load washer-dryer set for $599.99. That's as much as 50% off the price of the individual washer and dryer. "This really is an incredible deal, and it indicates how nervous retailers are about the season," said Britt Beemer, retail analyst and chairman of America's Research Group.